Where else can you see singing sheep and a tap-dancing cow? If there's one thing that the UK does best, then it is definitely pantomime. And this quaintly British theatrical creation can be seen at its very best at the Lichfield Garrick Theatre where the classic panto Jack and the Beanstalk is playing to packed audiences. 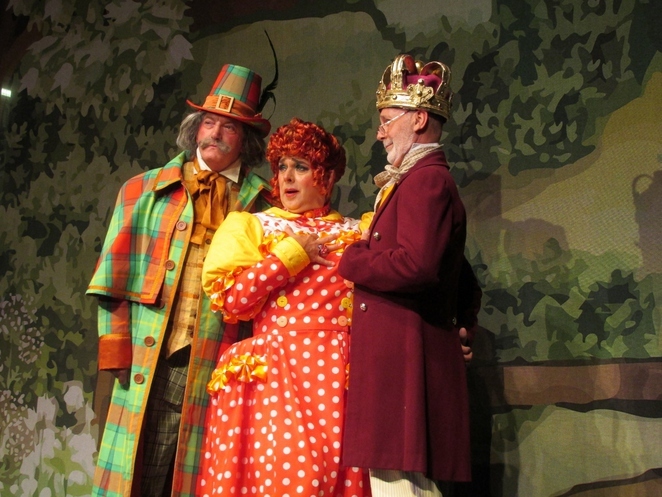 Ian Adams, who again takes on the role of Lichfield 's favourite Dame, has written and directed the Garrick's annual pantomime for the ninth year in succession. And what a fabulous job he makes of it. 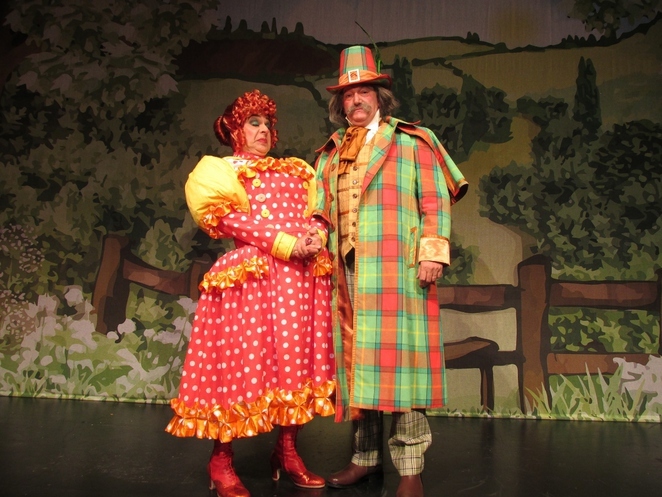 As well as the traditional panto ingredients, such as booing the villain, a thigh-slapping hero, and children (and adults) screaming "he's behind you", Ian has also thrown in a number of welcome additions. These include a wonderful slapstick take on 'The 12 Days of Christmas' involving a well-known TV shopping channel, an hilarious routine around supermarket name puns, and jokes clearly aimed at adult members of the audience including references to George Osborne and a garlic diet. Ian takes on the role of Dame Mary Trott who is faced with losing 'her' dairy farm to the Giant and his evil henchman Hemlock, splendidly played by Graham Cole in a complete change from his previous long-running appearances as PC Tony Stamp in ITV police drama 'The Bill'. 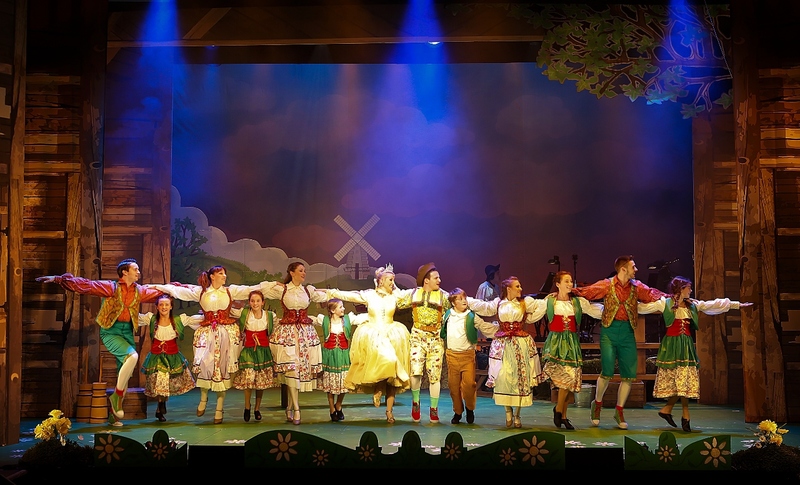 But there are excellent performances all round, including Jordan Ginger as Simon, Jo-Anne Stevens as Jill, Dominic Adam Griffin as Jack, Tony Stansfield as King Percival and Hannah Bennett as Fairy Buttermilk. 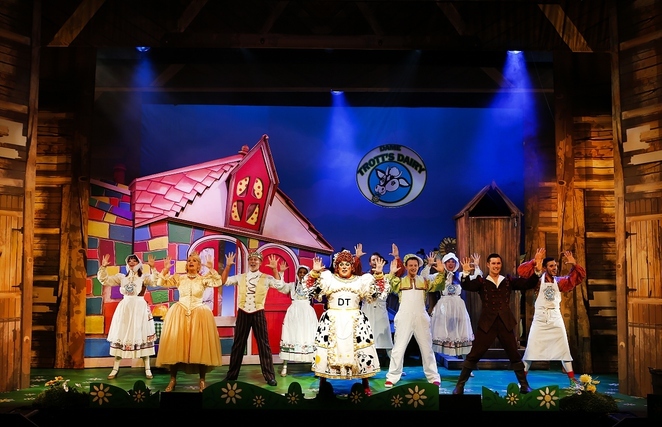 But this all-singing show is almost stolen by Daisy the tap dancing cow and a delightful quartet of singing sheep. Jack and the Beanstalk continues at the Lichfield Garrick until Sunday 3 January 2016, with ticket prices starting from £12.50 for children and £21.50 for adults. I love it when pantomimes make current political/satirical in-jokes; it means that even if the show has been put on a hundred times before, it is always different, and makes it more appealing to adults.